What Are Heel Protectors / Heel Boots? 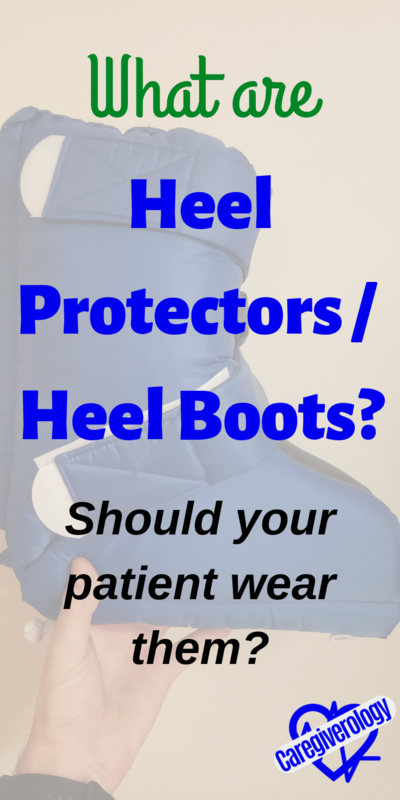 Heel protectors do exactly what they sound like, protect your patient's heels. Some patients on bedrest can easily form bed sores on their heels if they aren't worn. Because a lot of them are so bulky and uncomfortable, your patient will most likely hate wearing them. They also tend to restrict leg movement because they are so heavy. This should not stop you from encouraging them to wear them as much as possible. Just remind them that if they develop a pressure ulcer, they will become even more uncomfortable and they cause further complications in their care. Of course it's best to wear them before one is formed rather than after. If they still don't want to wear them, make a deal with them to either wear them for a few hours at a time or at least during the night. The more, the better. There are a few different kinds of heel protectors. As far as comfort goes, smaller is better. I've seen patients with heel protectors that are no more than a strip of foam with one strap that wraps around their heel while others are large enough to fill a duffle bag. The kind my hospital provides is extra bulky and thick and are one of the more complicated designs to put on. It looks like a long boot so we often call them heel boots. Below are instructions on how to put this kind on a patient. First, make sure all the velcro straps are out of the way. I actually attach the velcro to the strap itself so it doesn't get stuck or caught on anything. I do the same thing when I take them off of a patient as well. Then lift the patient's leg up high enough for you to slide it underneath their foot and leg. Grab the boot and slide it underneath and up their leg until the foot, including the heel, is flush with the bottom of the boot. Then wrap the straps attached to the leg portion of the boot around the patient's leg to the other side of the boot securing it in place. Do not wrap it too tight or the patient will be even more uncomfortable. It just needs to be tight enough to be secured around the leg. 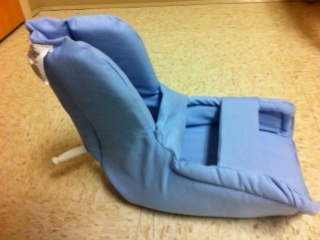 Finally, on both sides, stretch the straps at the foot all the way to the top of the boot which will lift the patient's toes up in the air close to a 90 degree angle. Double check to make sure the patient's heel is in a position that will relieve pressure. To take them off, simply release the straps and attach the velcro to the straps themselves so they don't get stuck to anything. Then just lift the patient's leg and slide it out from underneath them. It's that simple. Always take the heel protectors off at least once a day and check the patient's heels to make sure they are doing their job. If they didn't have bed sores before, make sure they still don't. If they do have them, make sure they aren't getting any worse or forming in another location. If they were put on properly, this should not be the case. You should also check every few hours and make sure they are not moving around or hurting the patient. If they are too tight, they may be cutting off their circulation. If they are too loose, over time, they may slide down the patient's leg or to the side which can twist their leg or ankle. You should also make sure they aren't leaning to the side twisting the patient's legs and ankles. This is so common, I have seen some heel boots with little kick stands to prevent this from happening which is a very useful feature. When your patient is wearing them and you need to turn them onto their side, place the foot on the opposite side of the side you are turning them on top of the other foot so that leg turns with the rest of the patient. 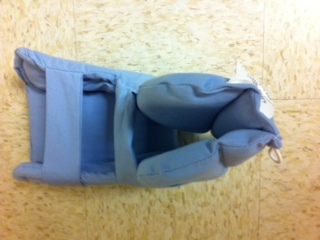 Do not let your patient get out of bed with heel protectors on because that would turn them into a major fall risk. Patient's should not even attempt to stand up with them on. If they are wearing them, turn their bed alarm on or if their bed doesn't have one, put a chair alarm on them just in case.